Multigenerational households are on the rise: The number of Americans living under the same roof with at least three generations has doubled since 1980. While these living arrangements offer many benefits, they also present potential fire safety challenges. With that understanding, NFPA and the U.S. Consumer Product Safety Commission (CPSC) have developed "Fire Safety for Multigenerational Families Living Together," a toolkit featuring tips and recommendations to help increase multigenerational households’ safety from fire. Multigenerational households may include older adults, very young children and people with disabilities who require added assistance in the event of a fire. So while home fire safety planning and prevention is critical for all families, for households with family members who have specific needs or limitations, advance planning is paramount to ensuring everyone’s safety. Install smoke alarms and alert devices to help family members who are deaf or hard of hearing. Alert devices, such as strobe lights, flash when the smoke alarm sounds. Pillow or bed shakers may be useful to wake a person who is sleeping. The shakers are triggered by the sound of the smoke alarm and shake people awake to warn them of a fire. Smoke alarms do not reliably wake up children. Older adults may not hear the smoke alarm. Assign someone to help children, older adults and people with disabilities escape. A wealth of free resources on fire safety for multigenerational families, including lesson plans, fact sheets, promotional materials and infographics (in English and Spanish) are available online. The Boston Bruins Foundation is holding a First Responder Challenge for the first time on Sunday, January 22 at the TD Garden in Boston for New England area first responders, families and friends. Firefighters, police and EMS professionals will take on one or all stages of the Garden Gauntlet -- climbing stairs, and completing laps around the arena bowl, premium levels, and balcony levels of the Bruin's home arena. Participants can walk or run. There are three levels: one for everyone, a slightly higher level of exercise and then an elite course (challenge level can be determined at the event). There will also be a children’s obstacle course, “touch a truck”, Bruins alumni appearances, photo opportunities with Bruins' mascot, Blades, and other family activities. Proceeds benefit The Hundred Club of Mass., which supports the families of police officers and firefighters killed in the line-of-duty. Winners will be presented with a trophy on ice at the second annual First Responder Night at the Bruins vs. Phoenix Coyotes game on February 28. The NFPA Standards Council, upon request from the National Electrical Code® Correlating Committee, at its December 2016 meeting has decided to combine Code-Making Panels 6 and 7 to create a new Code-Making Panel (CMP) 6. The new CMP 6 article assignments would be: Articles 310, 320, 322, 324, 326, 328, 330, 332, 334, 336, 338, 340, 382, 394, 396, 398, 399, 400, 402, Chapter 9, Tables 5 through 9 and Annex B. The Standards Council is also reassigning the work of Code-Making Panels 4 and 10. Articles 225 and 230 are reassigned from CMP 4 to CMP 10. In addition, Article 215 will be reassigned from CMP 2 to CMP 10. CMP 4 will now be assigned Articles 690, 691, 692, 694, 705, and 710. CMP 10 will be assigned Articles 215, 225, 230, and 240. CMP 19 will be renamed CMP 7 with no changes in article assignments. Representation is sought in all member classifications; specifically applicants with expertise and experience related to the work of the respective panels. All existing members of the Panels, as well as other interested individuals, are asked to apply. NFPA Staff will return to the Council at the April 2017 meeting with a proposed start-up roster. To apply for membership on any of these Panels, you must first sign-in on NFPA.org (Note: If you do not have an NFPA.org sign-in, you will be asked to create a free online account before using the application system). Go to the Technical Committee tab of the NFPA 70 Document Information Page and select the link “Submit Code-Making Panel _ application online" to apply to the appropriate Panel by the February 14, 2017 deadline. Happy 2017! Time for the first "Fire Code Friday" post of the new year. 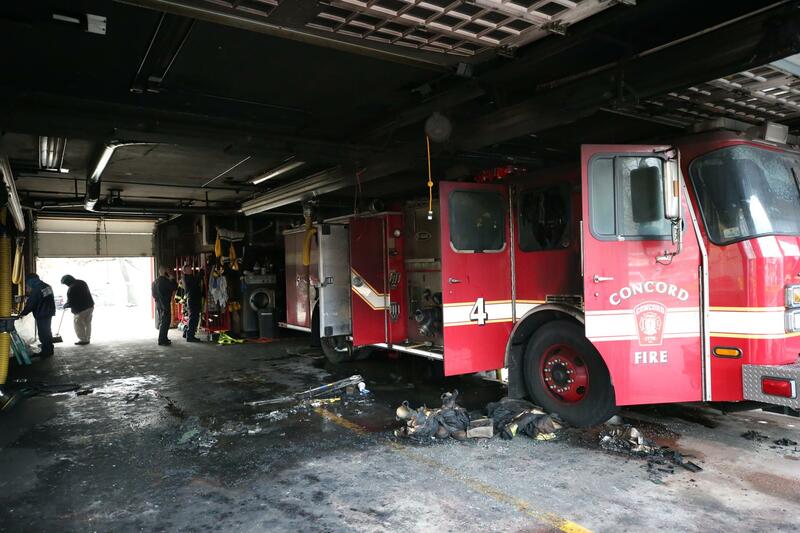 This past Wednesday, a fire that occurred locally at a fire station in Concord, MA, highlighted one of the valuable provisions in NFPA 1, Fire Code. Early Wednesday morning, just after midnight, a fire broke out on the first floor of Station 2 in Concord, MA. Three firefighters were on duty and at the station at the time the fire occurred. The first floor of the station sustained heavy damage (not structural) and the second floor had minor damages. Two fire engines and one ambulance were also damaged by the fire. The presence of smoke alarms in the station woke the firefighters and they were able to quickly and safety escape. They were even able to assist in fire fighting operations from the outside of the building. 13.3.2.3 New fire stations shall be protected throughout by an approved automatic fire sprinkler systems. 13.3.2.3 New buildings housing emergency fire, rescue, or ambulance services shall be protected throughout by approved supervised automatic sprinkler systems. 4.1.5.1* Public Welfare Goal. The public welfare goal of this Code shall be to maintain a high probability that buildings and facilities that provide a public welfare role for a community continue to perform the function for their intended purpose following a fire, explosion, or hazardous materials event. 4.1.5.2* Public Welfare Objective. Buildings and facilities that provide a public welfare role for a community shall be designed, constructed, maintained, and operated to provide reasonable assurance of continued function following a fire, explosion, or hazardous materials event. Section 4.1.5 includes requirements intended to maintain a high probability that certain buildings or facilities operate during and after an emergency event, such as a fire, an explosion, or a hazardous materials event, in order to provide an anticipated critical public service. Such facilities might include hospitals and public safety buildings (fire and police stations.) The requirements for providing automatic sprinkler protection in new buildings housing emergency fire, rescue, or ambulance services is one way of ensuring this goal and objective of the Code is met. This fire had a relatively happy ending. Yes, costly damage occurred to equipment and the building, but three lives were saved. These firefighters are able to continue their job saving others and giving back to the community of Concord. There seems to be a gap between the NFPA 70E® knowledge of the employee actually conducting justified energized work and everyone else who uses the standard. There are a lot of requirements that the employee must follow but somehow they are unaware of many of them. The employee may know something about PPE but not much more. Even the PPE knowledge may be minimal. They may be aware of the work permit but are only concerned with certain aspects of it. Often, the employee is told what needs to be done and they do it. No questions asked. Regardless of the employer’s plan, it is the employee who has the biggest impact on their own electrical safety. You are the one who being placed into harm’s way. Your safety is at risk. You should take a proactive role in it. An employer is required to provide safety-related work practices and training to you as part of your job. They must teach you to be self-aware of the hazards and actions you take. They should also instill in you a sense of self-discipline. Your employer must also train you to perform the tasks, recognize the hazards, to understand the potential injury from those hazards and how to protect yourself from those hazards. You are responsible for implementing each of these into your work. Many of these are synonymous with common sense. Your employer may train you, audit you, and retrain you. No matter what is taught to you, it is you who will make decisions and take actions that either injure you or not. Only you can determine if you are truly qualified to perform a task on a piece of equipment. The following scenario is a typical thought process that you should have when assigned a task. Consider that you are handed an energized electrical work permit (EEWP) to perform a task. The EEWP is filled out and signed by everyone but you. Do you accept that it is justified for you to be put at risk of injury? If it is not justifiable work do you speak up? Is your potential injury worth it? Those signing may agree that it can be done safely. Do you feel that it is not as safe as they believe? Maybe some of the steps to safely perform the task are missing. Do you point them out? Is a potential 2nd degree burn something you would rather live without? Are there some other controls that could be implemented which would significantly reduce the hazard or risk to you? These should be implemented and the permit modified. Maybe you know of a way for the work to be done in an electrically safe work condition. If you will not sign the EEWP for legitimate reasons the work should not be conducted. You should not feel forced to put yourself at unnecessary risk. Everyone, including you, finally agrees that the energized work is justified and can be conducted safely. Hopefully you aware that a job briefing is required before the task is conducted. This must cover many things. A sample checklist is provided in NFPA 70E. If a briefing is not held you should not begin the task. You now have another opportunity to address any concerns you have about the task and your safety. You should discuss the work procedure so that it is fully understood before beginning the task. What happens when you realize that you are not qualified to open the gear or perform the task? You are the only one who knows whether or not you are truly qualified to perform that task on the specific piece of equipment. A more appropriate person should be assigned to do the task. This is not about saving face. It is about putting yourself in a situation that you are ill equipped to handle. You should not attempt something you are not qualified to do. You acknowledge that you are qualified to conduct the task on the specific equipment. You are given all the tools necessary to perform the task. Do you inspect the gear? Do you reject anything that is questionable? Do you verify that it is properly rated for the task you are conducting? The equipment is from a different manufacturer than expected. Do you use it? You have not been trained on it. You should not assume that it functions the same way and using it the same way could put you at risk. Finally, you have everything you need to perform the task. You suit up and are about to open the gear but notice that something is not quite right. There is a wisp of smoke drifting from a ventilation opening. Do you open the gear anyway? You should not since the parameters of the EEWP could be exceeded. Your equipment may no longer protect you from the unexpected hazards inside. A new risk assessment must be performed before you continue on. The new risk assessment determines that there is no greater hazard or risk of injury so you return to conduct the authorized task. This time when you about ready to start pulling the cables you notice that you cannot see into the location. There are several bad things you could do that are not specifically covered by the standard and should not be done, but a few are specifically called out since they should never be done in energized equipment. One of those is blind reaching. You must be able to see the location where your task will be conducted. There is no way to assume that the task can be safely performed if you cannot see what you are doing. Work must stop again. The permit and task are changed to specify access from another direction. Back at the equipment this time, you realize that it is too dark on that side of the equipment. Do you grab a flashlight? This was not part of the EEWP or job briefing. Holding a flashlight while performing the task can dramatically alter the risk you are exposed to. You should not perform the work until appropriate and sufficient light is available. By the time temporary lighting is available you have been called off the task and have moved on to another more pressing issue. You are well into overtime but your employer wants you to finish up the original task before you head home. You had bad fish for supper and are sick. Only you can recognize that you are fatigued or ill and are no longer capable of performing the work safely. Do you risk it or speak out for your safety? Many of these are things that you should consider even without having any knowledge of NFPA 70E. I also have not covered things that are not your responsibility under the requirements of NFPA 70E. You must be able to work safely. You know when something does not seem quite right or safe. You make the decision to use a short cut at the cost of risking your safety. You should read and understand what your employer’s and your roll is when it comes to electrical safety in the workplace. NFPA 70E is not just about the actions your employer took before the incident investigation. NFPA 70E is about preventing you from being injured. Your family wants you to return home at the end of the day. When the time comes only you can decide if you are qualified for the assigned task on the specific equipment and are working safely. Your actions and decisions will directly affect your personal safety more than anything anyone else does. They are your choices. Make the right ones. Next time: Have you really justified energized electrical work?